Canada Geese can tell time! Jack Miner was effusive in his praise of the intelligence and faithfulness of Canada Geese. But he may not have been aware of their ability to tell time. Our last visit to the Jack Miner Migratory Bird Sanctuary took place about 25 years ago. The sanctuary is located on the original Miner farm on the shore of Lake Erie, close to the town of Kingsville. At that time, Manley Miner, Jack’s son and already elderly himself, was the manager. There is a narrow field between the Lake and the road running south of the Miner homestead, and here is where Manley fed the geese twice a day. The afternoon feeding is scheduled for 5:00 and when we got there at a quarter to five there was not a goose to be seen. There were other people there to watch and one of them told us “They’ll all be here by five. Just wait and see.” We wandered around while waiting, the minutes ticked by and we didn’t see any sign of a goose. At five minutes before the scheduled feeding time we heard a faint honking in the distamce. Then more honking coming from a different direction, and then from another. Soon geese were landing on that strip of land and by 5:00 there were hundreds of them on the ground, loudly greeting each other. It wasn’t that they saw or heard Manley coming with his little tractor and wagon load of cracked corn. He was fifteen minutes late that day. But the geese knew when he should have been there. Our Saskatchewan license plates proclaim that this is the “Land of Living Skies,” I suppose that refers to the gorgeous sunsets that we see pretty much every evening. In spring and fall it could also describe the flocks of migratory birds that pass over our heads. Especially in fall. In spring the birds are in a hurry to get to their summer breeding grounds in the arctic, but in fall many of them linger for a month or two, gleaning in the harvested fields. In summer, every pond, slough and lake is filled with ducks of some kind, along with a variety of smaller shore birds. A few Canada Geese and Sandhill Cranes spend the summer here, but most go farther north and are only seen, and heard, in spring and fall. Tundra Swans pause here only briefly in spring and fall. By now most of the birds of summer have left for a warmer climate, Canada Geese and Sandhill Cranes were around in abundance for awhile but by now they too have moved on. The Snow Geese are still here. We can hear them on a nearby pond pretty well any time of the day or night. Their voice is a little higher pitched than Canada Geese and they gather in much larger flocks. There are two colour morphs among them, white and blue, with the white form being predominant. As we drive down the roads we will see a field or a pond that is turned white by huge flocks of Snow Geese. As we get closer, we see that there is some colour mottling because of the darker geese mingled with the white ones. This morning at 7:30, I was sitting at my computer when I heard a sound above the humming of the furnace (yes, we are getting into that time of year here in Saskatchewan). I rushed outside to look and there was a huge cloud of Snow Geese flying low overhead, all talking at once. I believe there must have been 2,000 of them. Probably heading for a field somewhere for breakfast. Over half of these birds will have been born in spring and have never made this journey before. But they know where they are going and next spring they will make the journey back along the same flyway, just as Snow Geese have done for as long as there have been Snow Geese. i went for a walk down the road this afternoon. I could see from quite a distance that there were a couple of calves dining on the roadside grass and all the extended family was gathered in the corner of the pasture, inside the fence, watching. As I got closer, they all started telling the young ones to get back in where they belonged and where they would be safe from wandering humans. Finally the two young steers walked around the corner of the fence to where the wire was lower and jumped over the top back into the pasture. They were Charolais, a breed noted for their athletic ability. About half a mile in the other direction from our house there is a pond that is used as a camping place for migrating Canada Geese. There can be 500 to 1,000 of them there at any one time and the noise of their visiting gets quite loud at times. Skeins of geese fly over top and greetings are shouted between the flyers and the campers. At times, the whole clan will rise up off the pond and gather for a picnic in the stubble fields. There are also Sandhill Cranes foraging in the stubble field just south of us and from time to time we will drive by a field that is turned white by huge flocks of Snow Geese. Geese are social and gregarious birds, they love to get together and what? talk over their experiences of the summer? plan the route to their wintering grounds? Whatever it is they are talking about, they do a lot of it and it all sounds like friendly chatter. Chris and I are planning to attend a human family gathering on Saturday. A bunch of family and friends will be getting together to help my cousin Lyle and his wife Fyrne celebrate their 60th wedding anniversary. We will have to travel more than three hours to get there, but this is the area where I lived until I was nine years old, so it will feel like I am going home. We cousins don’t get together that often, but when we do, the noise of our visiting might not sound a whole lot different than a gathering of geese. I was thinking today that gatherings such as these will become quite rare in coming generations. Marriages break up, a lot of people never bother getting married, children aren’t sure where they fit in and extended families do not seem to hold together anymore. Any couple that has been married 40, 50 or 60 years has experienced a lot of bumps in the road — misunderstandings, hurt feelings, unkind words, anger. But little by little they have learned to understand one another a little better and to forgive one another. After many years, when the children and grandchildren gather round, we see that it was worth it all to stick it out and repair the breaches in our relationship. Eventually we come to realize that this person who has borne with us all these years, and suffered many wounds from our selfishness and carelessness, is a pretty special person. Those who are ready to call it quits at the first bump in the road will never know that feeling. And their children will never know the security and stability of a home where parents know that home and family are more important than feelings that soon pass. I was working outside this afternoon, putting our water hoses away for the season and listening to the chatter of Canada geese from a pond about a half mile away. I couldn’t see the pond from ground level, there is a railway line between here and there that is built up high enough to block the view. When a flock of a hundred or more took off, I thought that was probably all there was. A minute or two later there was a thunderous roar as at least 500 geese lifted off. After that, I could still hear the sound of geese from the pond. Then another flock of a hundred or so left and a little later another group the same size. Finally about fifty more took off and then all was quiet. They will go and glean in the harvested fields around here and probably return to the pond for the night. 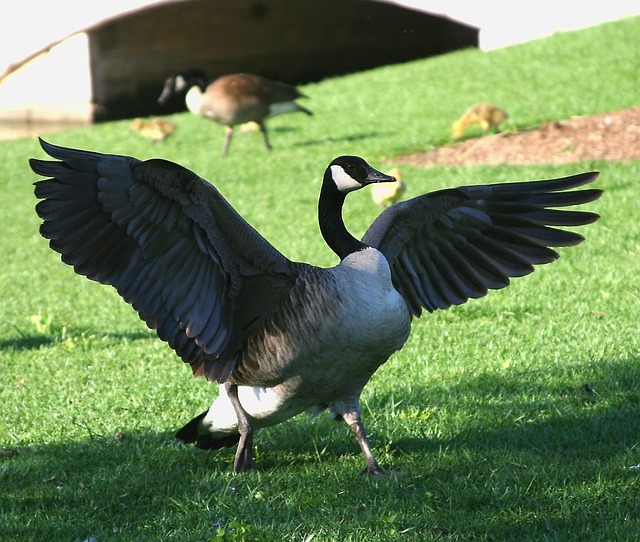 Jack Miner had a very high regard for the Canada Geese, they mate for life and the gander is an exemplary father. In 1907 one old goose at his bird sanctuary became too weak to sit on her nest so Jack Miner and several other men fought off the gander , who he had named Jack Johnson because he would fight anything that threatened his mate and nest. They took the eggs and gave them to a Plymouth Rock hen to hatch. All six eggs hatched and the goslings accepted the little black and white hen as their mother. When they were five weeks old, Jack Miner led them to one of the ponds and left them there. The old sick goose heard the call and staggered over the bank of the pond as fast as she could, with Jack Johnson running back and forth between her and the goslings as she came. “I don’t want any reader to ask how it was that this old pair of beauties knew their young. I only know they did know them; that is all. There I stood, bare-headed and bare footed at the most beautiful time of the day. The whole earth seemed to be transformed into a rainbow of God’s love, with both ends pouring out upon this one spot; for to see this dear old, broken-hearted father and their sick mother united and knowing their six loved ones which they had never seen, or, in other words, standing and witnessing the reunion of this broken family, caused my brain to fairly whirl in thought, until I melted down, like a little child.